The article examines prejudice from the point of view of what it performs. Using Winnicott’s understanding of ‘basic trust’ transposed into a social context, I argue that discrimination undermines ‘basic trust’. Fassbinder’s film Fear Eats the Soul (1974) shows how ‘everyday racism’ impacts on the addressee’s sense of self and surrounding others, and orientation in the world. Since ‘basic trust’ denotes something that is usually pre-reflectively taken for granted, it is not within the range of an average person’s imagination in a normal setting to know what it means for it to be taken away. I argue that Fear Eats the Soul does some work towards compensating for this absence. This article examines social discrimination from the point of view of what it performs. Using Winnicott’s understanding of ‘basic trust’ transposed into a social context, it is argued that a prominent characteristic of discrimination is that it undermines ‘basic trust’. Rainer Werner Fassbinder’s film Fear Eats the Soul (1974) serves as an illustration of how ‘everyday racism’ impacts on the addressee’s sense of self, surrounding others, and orientation in the world.1 Where Winnicott’s concepts are intended as universal, however, Fassbinder’s film contains a critical analysis of power relations, so as to reveal how forceful asymmetries are operative and impact not just on large-scale (macrosocial), but also on intimate (microsocial) levels of interaction. The argument points towards a problem with regard to identification. Since ‘basic trust’ denotes something that is usually pre-reflectively taken for granted, it is not within the range of an average person’s imagination in a normal setting to know what it means to have it taken away. This film provides some compensation for this absence through its enabling of identification and its dramatic disruption of it, which forces the spectator to question certain unexamined patterns of identification. Any impingement, or failure of adaptation, causes a reaction in the infant, and the reaction breaks up the going-on-being. If reacting to impingements is the pattern of an infant’s life, then there is a serious interference with the natural tendency that exists in the infant to become an integrated unit, able to continue to have a self with a past, present, and future (Winnicott, 1971, p. 86). Translated into a setting in social space, one might think of such things as having one’s own name and being addressed by it, going to a shop to purchase an item and receiving it while being understood and taken seriously, or sitting with colleagues during one’s lunch-break and sharing in their conversation as constituting everyday experiences of continuity. Similarly, one may assume that being greeted in a situation where this would seem natural, apologized to if one has been wronged, spoken to rather than merely about, and looked in the eye rather than avoided and stared at, can be taken as relatively unproblematic underpinnings of going-on-being. Fassbinder’s Fear Eats the Soul describes a situation where this sense is disrupted. Emmi – And you spend your evenings here? Ali – Yes, good music, Arab buddies. Don’t know other places. Germans with Arabs not good. Ali [shrugs] – Don’t know. Germans not same people as Arabs. Emmi – But at work, surely…? Ali – Not the same. German master. Arab dog. Ali – Who cares? Better not think too much. Think much, cry much. In this first dialogue, we thus encounter the film’s theme of the everyday racism with which the protagonists are faced, to be followed by descriptions of the near-total hostility of their surroundings, as seen in a range of ordinary, small-scale social settings. The fact that the relationship between Emmi and Ali is described with some warmth adds multidimensionality to the story, an otherwise bleak narrative of harsh social discrimination where the hope of improvement is scarce. Emmi – Your name is Ali? Ali – Not Ali, but everyone says Ali. Now I am Ali. Emmi – What’s your real name? Ali – El Hedi ben Salem M’Barek Mohammed Mustapha. Emmi – That’s pretty long. Ali – Yes. In Tismit all names long. His answer, “Now I am Ali”, reveals that he has taken upon himself the identity given to him by the others, conveying a sense of alienation that runs deep. It also emerges in this conversation that Ali is not even the protagonist’s real name, but merely a generic term for Arab guest workers. According to Bingham (2003), Fassbinder originally intended to give the film the title All Turks Are Called Ali. Thus, the name ‘Ali’ provides an example of condensation as inherent in prejudice; it denotes not only a different individual from the one in question, but something that is not an individual at all, but a general category. The experiential basis of the concept of the true self, of ‘being alive’ or ‘feeling real’, often passes unnoticed and remains unquestioned, and might have remained unremarkable but for the presence of its opposite. It belongs to the sphere of the intimate and familiar life-world, where being responded to, and experiencing the social context as meaningful, are states taken for granted and not normally thought about. By contrast, the formation of the false self, experienced from within, gives rise to a feeling of being unreal, and to anger as well as to sorrow, both of which seem groundless from the outside (Winnicott, 1960/1965, p. 148). “If the environment is not reliable […] all that we can see is a false self engaged in the double task of hiding the true self and of complying with the demands that the world makes from moment to moment” (Winnicott, 1955, p. 147). The figurative holding alluded to above is not normally felt; being held, because taken for granted, is not usually noticeable, while falling (due to being dropped) or disintegrating is. In Jan Abram’s words (2007): “Winnicott’s view of the good-enough holding environment begins with the mother-infant relationship within the family and grows outwards to other groups in society” (p. 195). 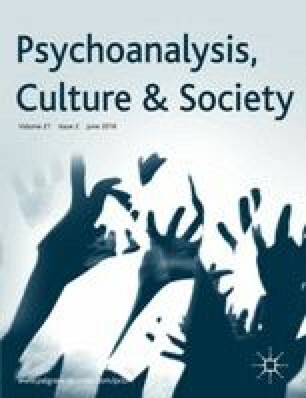 The phenomenon of prejudice or discrimination reveals a similar quality of social space to the ‘holding’ referred to above, in that the interpersonal exchanges and environmental characteristics that support one’s experience of personhood are not usually thought of until a situation occurs where they are no longer present. Something is then attacked which is supposedly unassailable, which one would have thought it did not make sense to question. In Fear Eats the Soul, these attacks take the shape both of active intrusions – Winnicott’s ‘impingement’ – and non-responsiveness. One scene in the film shows Ali going to the nearby grocer’s to pick up an everyday item. In spite of Ali’s repeated attempts at communication, the grocer stubbornly presents him with two other items, different from the one Ali requests. It is clear from the context that the grocer does understand what Ali wants, but he refuses to give it to him – it is an active refusal to understand, or to convey an understanding of, his intention. The grocer’s approach, to allude to Gadamer, could be said to exemplify ‘The Principle of Malevolence’ in interpretation – he is depriving Ali of his communicative intent, even while admitting that it is present, that he has grasped what he wants. Someone who is understanding, writes Gadamer (1960/2004), “thinks along with the other from the perspective of a specific bond of belonging, as if he too were affected” (p. 320). The grocer is not unaffected – as he later admits, he hates foreigners – but his sense of sharing a common ground with Ali is absent to such an extent that he aims to destroy the meaning of what Ali is saying. In terms of trust, it would be trivial to state that the grocer does not trust Ali, but the point here is that the grocer, in his actions towards Ali, performs something more all-encompassing in contributing to undermining his sense of living in a trustworthy environment. Ali, of course, is not unduly surprised, in that he knows of the degree of hostility in his surroundings. But the example serves to show how a situation usually thought of as so ordinary as to be exempt from reflection – a visit to the grocery store – has here become a threatening scene, where a degree of guardedness is required. Thus spontaneity must be withheld in a situation where a degree of ‘holding’ ordinarily expected is absent. Concierge – Imagine. Mrs. Kurowski has got a foreigner up there. Neighbour – What? A black man? A real black? Concierge – Well, not that black, but pretty dark. Neighbour – She’s not really German herself. With a name like Kurowski. Concierge – What are things coming to? Neighbour – I wonder what she is doing with him? From the first moment when Emmi and Ali step into the block of flats where she lives, and they themselves will be living, the concierge and the neighbours engage in acts that invade the couple’s private space, and exhibit intrusiveness, a sense of scandal, contempt and condemnation. The couple is never left in peace; they do not escape the ever-present gazes of others. A prominent feature recurring throughout the film is how the scenes showing Emmi and Ali are shot from a distance. We repeatedly see the two main characters together, surrounded by an empty space, conveying the couple’s social isolation; the framing also reveals their somewhat shy, hesitant manners and the way that they are keenly observed by others from a distance. Two scenes in particular stand out in this respect. In one, Ali and Emmi are shown sitting in a restaurant after their wedding ceremony; they are seen through a doorframe with empty tables on each side. Another shot reveals that a waiter is standing by the door several metres away from them. In a later scene, the couple is shown sitting at a table in an outdoor restaurant, surrounded by a sea of yellow tables and chairs, all of which are empty. At a greater distance, outside the door of the restaurant, two waiters and four or five other people – a small crowd – are standing, watching them. Again and again, the protagonists are shown in the position of being looked at and judged. It seems most appropriate at this point to recall Sartre’s analysis of ‘Being-seen-by-the-Other’ as a shattering experience of being fixed as an object in a world that has now been made alien. For Sartre (1943/2003), in apprehending the Other’s look, “I experience a subtle alienation of all my possibilities” (p. 288): I am endowed with an outside, solidified; I lose my freedom in order to become a thing. In so far as my freedom escapes me and I become a given object, I can become ashamed. What Sartre describes as the quality of the look as such is not descriptive of just any gaze, but a specific kind, namely the objectifying gaze. In Fear Eats the Soul, the characters surrounding Emmi and Ali seem to do all they can to instil shame in the protagonists, and they do so by standing apart, by keeping their (physical) distance, or by creating it. At the same time, the opposite strategy of bursting in on them, of not respecting their boundaries, is also widely employed. The images in the film display the protagonists as either being narrowly confined within restrictive spaces – as if trapped, imprisoned – or as surrounded by too vast, open, empty spaces; as if liable to fall due to the lack of support. Ali – Ali much alone too. Always working, always drinking. Nothing else. Maybe German right: Arab not human. Emmi – Nonsense! You mustn’t even think that. You said yourself, thinking makes a person sad. Though it’s not really true… [At this point Ali begins to stroke her arm.] That thinking makes you sad. Or? Of course not. What else should we do with our time? All the years, all the months, and suddenly it’s all over, and what is there to show for it? Though the transcript of what the characters say may not suffice to convey it, this is a moment of great intimacy between the two. The words they utter are simple, but very much to the point in terms of emotional authenticity; they are present to one another, and it is a touching scene in the film. Ali, in a naked piece of communication, presents his doubts about his own humanity; the life he lives is not a worthy life for a human being, casting a shadow over his sense of self. Emmi responds by saying he should not even think such thoughts about his own worthlessness, and refers back to an earlier statement of his. In doing so, she acknowledges his subjectivity, conveys that she remembers what he has said, and then starts to reflect upon it, thus also implicitly recognizing his communication as being worthy of thought, of wonder, of further elaboration. Thus, to his verbal presentation of his experience of himself in a state of fragmentation, she responds by reflecting back a sense of greater wholeness, by reinstating meaning where it appears to be absent, and by seemingly ‘holding the pieces together’. To accentuate the opposite experience of ‘depersonalisation’, as seen in the Sartrean description of being reduced to an object and alienated by the other’s look, Winnicott (1970/1989) coined the term ‘personalisation’ to emphasise the necessity of others’ emotional involvement in seeing and building one’s subjectivity (p. 261). Ali – That woman no good. Emmi – Nonsense! She’s OK. She was just surprised. Ali – That woman has death in her eye. Emmi – No wonder. Her sister just died. Ali – No. Other death in her eye. Emmi – You’re imagining things. While Emmi states that her colleague is a decent person, Ali sees that the woman is not to be trusted. Emmi has presumably known her colleague for a long time; the colleague belongs to her familiar environment and is perhaps for that very reason felt to be trustworthy. The people around Emmi are probably what they always were; it is she who has now become unfamiliar to them by marrying an Arab man. Emmi is of course entrenched in this environment of which the colleagues, the neighbours, the grocer and the waiters form a part. This unreflective background of her being-with (Heidegger, 1927) these others causes her to regard them as being prima facie trustworthy, and it is precisely this background and this assumption that are now shown to be problematic. In aiming to believe that her colleague’s intentions were decent, she leaves one party out of the equation, so that Ali’s experience of the situation is invalidated. Thus, for Emmi to support her colleague, or the status quo, is not the neutral option it may seem, but an implicit betrayal of him. Emmi – My husband was Polish, not German. He was a foreign worker during the war. He just stayed on afterwards. My parents were still alive then. They said to me: “Emmi, this’ll come to no good.” Because he was a foreigner, you see? Cheers. Emmi – My father hated all foreigners. He was a party member. Hitler’s party. You know who Hitler was? Emmi – I was in the party, too. Everyone was… or almost everyone. But Frantizek and I got along fine. This dialogue is both alarming and puzzling. Emmi reveals on the one hand that she married a Polish man in spite of her parents’ wishes. On the other hand, her father’s virulent racism is mentioned light-heartedly – they even share a toast in the middle of their conversation – after which it appears that Emmi’s own party membership is not treated as a matter that calls for reflection or weighs on her conscience in any discernible manner. She merely dismisses it, stating that everyone, or nearly everyone, was also a party member. The shape of her reference to her late husband in this context (“Frantizek and I got along fine”) makes one wonder whether she is in effect saying, “he was all right, as opposed to all the others” – acknowledging an exception while simultaneously excluding it, so as to keep a generalisation intact. Emmi – This is where Hitler used to eat from 1929 to ‘33. I’ve always wanted to come here. Hitler, you know? Since this is just after their wedding ceremony, the scene previously referred to where the couple is observed through a door-frame, alone apart from the presence of the waiter, takes place here, in this spot that Hitler used to favour. (I discovered while doing some research for the present paper that this scene in the film is actually shot in the restaurant that was “[p]erhaps Hitler’s all-time favorite, which he continued to patronize even after the beginning of World War II”, the Osteria Bavaria, near the Nazi Party offices in Munich, to which “[c]hanges have been minimal, although the name is now Osteria Italiana [as it is in the film]” (Walden, 2000). Thus, this episode can be described as an instance of social realism.) It is probably worth noting that Munich was also the birthplace of the Nazi Party and remained the spiritual capital of the Nazi movement throughout the Third Reich period, with headquarter buildings, museums to house Nazi-approved artworks and memorial shrines. The DAP was founded in Munich in January 1919, which Hitler joined the following autumn. In 1920, when it was reorganized as the NSDAP, he outlined the Party programme to the public in the Hofbräuhaus beer hall, the beer halls being a significant source of his popular support. The city was also the scene for the attempted coup d’état of 1923, after which Hitler served one year in prison. The judge sympathized with the defendant, and allowed him to deliver long political speeches from the dock (Elon, 2002/2004). The outskirts of Munich were also the site of the first concentration camp, Dachau, built for political prisoners in 1933. The scene showing Emmi and Ali sitting in the restaurant is a shocking one, which could justifiably even be called grotesque. It calls to mind the analysis of Alexander and Margarete Mitscherlich in The Inability to Mourn (1975), translated into English at around the same time as the film was made, although originally published in German in 1967. The authors argued (Mitscherlich and Mitscherlich, 1975) that, in the nearly three decades that had passed since the end of the war, “the number of Germans able to orient themselves to political reality on the basis of a general recognition of guilt remains infinitesimal” (p. 44). After 1945, there was a blanket withdrawal from Nazi ideology, but no critical examination of the mindset took place, and as a consequence no securely established inner detachment from it was achieved. “The result is that fragments of this world view have been, so to speak, naively – because unthinkingly – preserved quite undisturbed” (p. 30). This, I believe, is what we witness in the above-mentioned scene, which makes such a bizarre impression. Hitler figures in Emmi’s statement as an ‘encapsulated’ inner object – one that is set apart, unassimilated, undigested. This perhaps contributes to the seeming unreality of the scene to the viewer. It is to be remembered that this defence against dealing with the past, remembering and thinking about the experiences involved, is a collective, not an individual one. In a setting where others would also prefer not to engage with it, what prevails is a socially sanctioned and upheld silence. In relation to the Jewish population of Germany, “the war was not lost; on the contrary, the ‘final solution,’ the extermination of a minority, was very nearly accomplished” (Mitscherlich and Mitscherlich, 1975, p. 30). My recent visit to Munich gave me a sense that this was especially true of this area. In contrast to Berlin, no attempts have been made to commemorate the Holocaust, save one small memorial that could be characterised as hidden away. The main synagogue in Munich was destroyed in the Kristallnacht of 1938, having been identified as a main target; the rebuilt synagogue was only opened 68 years later in 2006 (Gallu, 2006). Next to it lies the Jewish Museum (opened in 2007). Habituated as one is to the purpose of a museum as a place to exhibit cultural objects, one is struck by the fact that this museum is peculiarly, and deliberately, empty. A temporary exhibition of German Jewish émigré life in New York that filled the upper floor when I was there did not disguise the overall impression of a void, revealing the fact that there were hardly any objects left to exhibit – they had all been destroyed. Ali – Why do you cry? Emmi – Because I am so happy on the one hand… and on the other, I can’t bear it anymore. All this hatred! From everyone! Sometimes I wish I were all alone with you in the world with nobody around us. [Crying] I always pretend I don’t care, but I do. I do care! It’s killing me! Nobody looks me in the eye anymore. They all have such a horrible grin. They’re all swine! [Raising her voice for the spectators to hear] Dirty swine, all of them! Stop staring, you stupid swine! This is my husband, my husband [crying, resting her head on her arm]. The scene represents a turning point in the film, after which the others in their environment start to approach Emmi, inviting her back into their social life, but without extending the same courtesy to Ali. First the grocer, then a neighbour, then her son appear; having earlier refused her as a customer, the grocer now takes her back only for the sake of profit. (As he says to his wife, “in business one must hide one’s aversions”.) The neighbour, who had previously delighted in a sadistic attempt to make Emmi clean the stairs excessively, now asks to make use of Emmi’s space in the cellar. Her wish is granted and Ali helps her carry her things. (The subtitle of this paper is a quote from that earlier conversation, where Emmi told the neighbours to “put your own house in order, and I’ll see to mine” and the neighbour responded, “we have nothing to reproach ourselves with”.) The son was earlier seen kicking and destroying Emmi’s TV set when she introduced Ali to her three children, all of whom left in anger and dismay. Now he sends her a cheque to cover the cost of the damage and appears for the sole purpose of getting Emmi to babysit his daughter; his wife wants to start working part time. “You know I’ll always be there for you,” says Emmi. The son apologises for the previous outburst to Emmi, but not to Ali. Presenting an image of distanciation, a scene on the staircase represents a repetition of an earlier scene, now with a change of roles. In the earlier scene, we saw Emmi sitting on the staircase in the hallway, having lunch with her colleagues, during which she asks to be handed a knife. The others continue their conversation, ignoring Emmi, avoiding eye-contact with her and then walking further away. We finally see Emmi filmed from the side through the railings of the staircase, continuing her meal alone. In the later scene, a new cleaner is introduced: Yolanda from Yugoslavia/Bosnia-Herzegovina. While carrying on a conversation, we see the others, now including Emmi, walking away from Yolanda, again further down the staircase. The latter is seen sitting, in profile, filmed through the railings like Emmi before her. She attempts a hesitant smile at them, then gives up, and carefully continues eating her lunch. The image is reminiscent of that of a caged animal in the zoo – a strange spectacle to be looked at curiously, but cautiously, from a distance. Emmi – This is Ali. Say hello. Colleague 2 – Good day. Colleague 1 – He is a handsome one, Emmi! And so clean! Emmi – What do you mean? Colleague 1 – Sorry, but I always thought they didn’t wash.
Emmi – He does. He even takes a shower every day. Colleague 1 – And just look at those muscles! Colleague 2 – And such nice, soft skin! Colleague 2 – What’s eating him? Emmi – He has his moods. It’s his foreign mentality. Here we see Emmi paying tribute to the colleague’s prejudice about dirt and cleanliness: Ali “even takes a shower every day”. What follows is a thoroughgoing exercise in objectification, and when Ali can no longer stand the assault, and walks off deeply injured, Emmi tops it by nullifying his moral reaction, attributing it to “his foreign mentality”. One might claim that a piece of art seduces the spectator into identifying with it. One is addressed by it and takes it in before knowing its full meaning. For Freud (1908), the experience of an artwork is associated with the pleasure principle. We enjoy it because it liberates the tension in our minds; it enables us “to enjoy our own day-dreams without self-reproach or shame” (p. 153). The novel, he writes, “has a hero who is the centre of interest, for whom the writer tries to win our sympathy by every possible means and whom he seems to place under the protection of a special Providence” (p. 149). These interpretations can be seen to be too weighted towards narcissistic pleasure; Freud leaves out the experience of a pleasure in identification that is not linked with grandiosity, one more concerned with exploration than with idealization. Yet the purpose of referring to these views here is to point to the effect created by those narrative artworks that encompass the dimension of temporality by breaking off the state of identification. When this happens, the spotlight is turned back on the spectator. From having been inside the story and the characters, immersed in the experience, one is forcefully torn out of the context and prompted to start asking questions. In viewing Fear Eats the Soul, one identifies both with Emmi and with Ali.4 Then, when faced with the scene where Emmi invites her colleagues to feel Ali’s muscles, the viewer’s trust in Emmi is torn to shreds. As a spectator one is left with the feeling that one’s moral failure consisted in not distrusting Emmi sufficiently. This seems, in the aftermath, like stupidity. Doctor – He has a perforated stomach ulcer. It happens a lot with foreign workers. It’s the stress. And there’s not much we can do. We’re not allowed to send them to convalesce. We can only operate. And six months later they have another ulcer. Doctor – Oh, he’ll recover, but he’ll be back here again in six months. Doctor – [Produces a somewhat sad, strained smile.] Well, the best of luck anyway. And don’t stay too long. Goodbye. Once again the scene is shot through a doorway, where we see the doctor standing, looking at the couple from a distance. In the last frame, Emmi sits at Ali’s bedside – he is seemingly unconscious – holds his hand and then begins to cry. Is she crying for him, for their relationship or for herself? One is unable to tell. The doctor’s statement points to the social causes of the disease; the director’s political message is apparent. At the same time, the word ‘stress’ is a euphemism, one that dilutes responsibility; in this context, one would be inclined to state that the ulcer is caused not by ‘stress’, but by projected hatred. The doctor’s resigned response, furthermore, to Emmi’s statement that she will do ‘everything in her power’ articulates a pessimism that at this point is the viewer’s own. As an admirer of Douglas Sirk, Fassbinder strongly identified with the Hollywood director’s exploration of social oppression, yet Fear Eats the Soul is the only Fassbinder film directly inspired by a Sirk film, All That Heaven Allows (Cottingham, 2005, p. 27, Sirk, 1955). Although Fear Eats the Soul echoes the narrative in Sirk’s drama – a socially ‘unsuitable’ couple fall in love, are torn apart by the norms that surround them, and then reunite – the differences between the two films, to my mind, are far more striking than the similarities. The conflict in Sirk’s story revolves around class, in which a working-class gardener falls in love with an upper-middle class woman who is older than he. By changing the conflict theme to race and nationality, and by making his heroine older than in Sirk’s version, Fassbinder is more provocative than his source of inspiration, thus requiring the viewers’ identification to challenge their prejudices. As in Fassbinder’s film, the protagonists reunite after the hero has been struck by illness, but in Sirk’s character’s case this is caused by a fall, a mere accident that does not allude to the third parties’ responsibility. Where Sirk’s final scene is unambiguously romantic, in that the statement “I will do anything in my power…” signals a happy ending, the repetition of the same statement in Fassbinder’s closing scene occurs in a context that renders it satirical. We are fully identified with Sirk’s heroine when she utters these words, but when Emmi does so, our reaction is one of disbelief and resignation. The distanciation, the stepping-out, or rather being torn out, of the situation – such a prominent feature in Fassbinder – does not occur in Sirk, where the spectator remains comfortably identified with the protagonists, and as such blissfully unaware of his or her contribution, of co-responsibility. In Fassbinder, one’s own tendency, as a viewer, to side with the majority or the status quo – one’s wanting, as a seemingly ‘neutral’ third party, to overlook a violence that is clearly present (Auestad, 2012; 2015) – is exposed. This is why, in my view, though Fassbinder’s film is not new, it feels fresh, familiar and provocative. I have argued that what is performed in racist assaults and discriminatory practices is an undermining of ‘basic trust’ as conceived on a social level. This argument points towards a problem with regard to identification. Since ‘basic trust’ denotes something that is usually pre-reflectively taken for granted, it is not within the range of the average imagination to know what it means to have it taken away. In being led to identify with Fassbinder’s protagonists, we are in a position to co-experience to some degree such a fundamental failure of reliability. Thus the story questions the normativity of the seemingly ‘ordinary’ by its display of everyday situations where basic trust is undermined, and as importantly, by producing in the viewer a distrust not just of the characters and their surroundings, but also of one’s environment, perceptions and responses. Where Winnicott’s concepts are intended as universal, Fassbinder’s film contains a critical analysis of power relations, so as to reveal how powerful asymmetries are operative and impact not just on large-scale but also on intimate levels of interaction. Psychoanalytic thinking, here in its object-relational version, has a language for tracing and describing such interactions in fine-tuned sensitive detail, which allows for further reflection on the emotional conditions of social well-being, based on a perception of qualities otherwise easily missed. If we agree that there is such a thing as a fundamental social provision – ongoing and often unnoticeable – of emotional and mental as well as material resources, one that leads to a building up of a ‘social basic trust’, we may develop a vocabulary for critical thinking about this resource’s distribution. Such ‘social basic trust’, as we have seen, can also be excessive, as revealed in a tendency unthinkingly to presuppose the benevolence of the familiar environment. Hence, the political importance of encountering genuinely different perspectives, to de-familiarize the familiar and to enable multidimensional thinking about who is held and who is dropped, who is granted and who denied the conditions for ‘basic trust’ in contemporary society. This reading focuses on the theme of racism in Fear Eats the Soul to the exclusion of some other aspects of the film. For an interesting reading that highlights the gender aspect, see Mulvey, 2009. For a thorough account that situates Fassbinder within German society and culture, see Elsasser, 1996. The quotations from the film are based on the English subtitles, translated by Peter and Walraut Green. Ali’s statements in English reflect the fact that his German is ungrammatical, as does the film’s German title, which cites a statement of his. The insertions in brackets are my renderings of those characters’ actions or sentiments that are essential to grasp the content of the conversation. For a psychosocial analysis of the role of ‘neutrality’ and power in prejudice, please see Auestad, 2012 and 2015. Admittedly there is some degree of subjectivity in this statement, and my interpretation is not necessarily valid for everyone. The reader may test his or her own reactions by watching the film. I would like to thank Steffen Krüger, Peter Redman and the anonymous reviewers for their thoughtful comments which have helped improve this article. Bingham, A. (2003) All that heaven disallows. Bright Lights Film Journal 42, http://www.brightlightsfilm.com/42/ali.php, accessed 19 September 2010. Gallu, J. (2006) Munich welcomes new synagogue. Der Spiegel Online International, August 11, http://www.spiegel.de/international/0,1518,447720,00.html. Walden, G.R. (2000) Third reich in ruins. http://www.thirdreichruins.com/munich.htm, accessed 2 September 2010.